In the period around the 1980s, the process of securitization of home mortgages transformed illiquid assets into liquid assets. The transfer of illiquid assets off the balance sheet reduced financing costs for the banking system and the amount of capital demanded by Basel I. 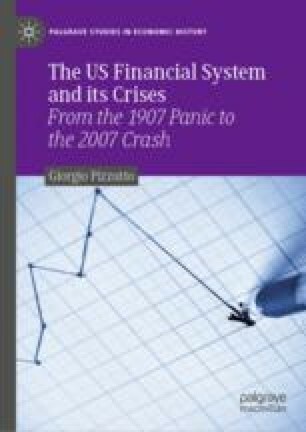 The banking system and the Basel regulators believed that this process relocated risk outside of the banking system, which has always been considered a primary source of systemic risk. The securitization process is part of a market mechanism that strengthens the bond between the money market and the capital market while introducing elements of instability into the financial system. The securitization process involves many steps where financing of the money market continues to play an important role. From mortgage accumulation to the structuring of securitized assets and the sale of tranches to final investors, the dealers control the sequential intermediation process, extending their activity into a completely new market segment. The dealers had always been present in the primary and secondary markets where public and private stocks and bonds are traded. In the 1990s, securitized products entered the market, financed as always via the money market. At the beginning of this century, the Fed implemented a very expansionary monetary policy that reduced yields on all short- and long-term financial assets. Not only did interest rates fall under expansionary monetary policy, but risk premiums also tended to shrink significantly because of the increase in demand for high-risk financial assets. Financial intermediaries shifted to these assets, in part by increasing leverage, to obtain higher yields. The reduction in the spread also reduced volatility. On the other hand, when monetary policy becomes restrictive and interest rates begin to rise, the risk premium tends to rise and the profitability of the intermediation process declines.